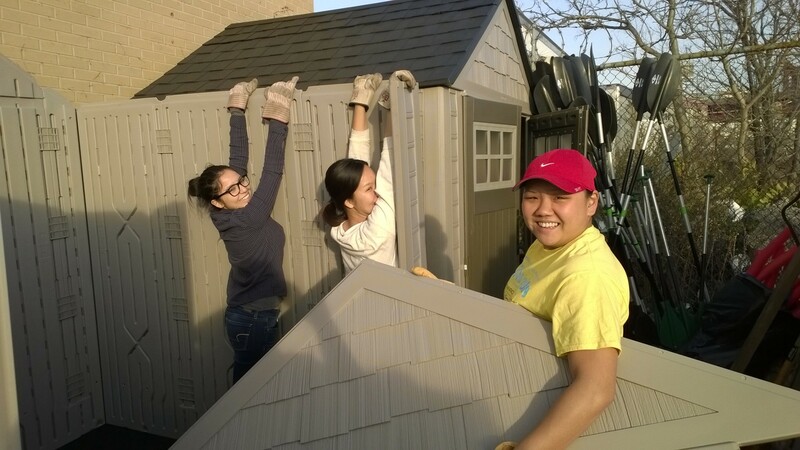 Diana, Miyeon, and EJ at work on the second shed. HarborLAB volunteers had an amazingly productive Sunday, and had lots of fun in the process! 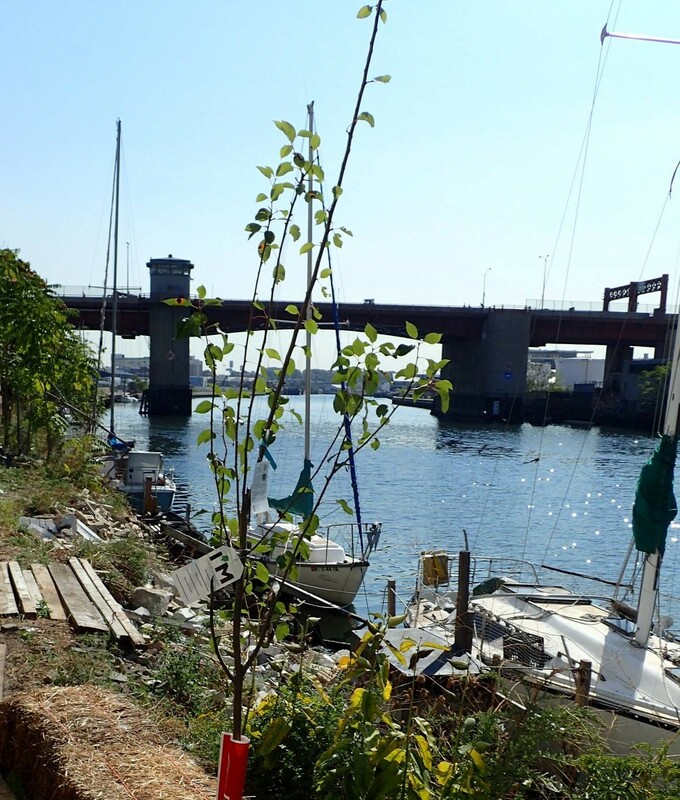 Our goals were to winterize our Newtown Creek waterfront site and prepare it for transformation into the GreenLaunch in the spring. It sure felt like spring already! We assembled a second shed and platform, repaired “The Jenni” tandem Folbot kayak for use by Baruch College environmental science classes (named for our late friend and CUNY alumna, Jenni Jenkins), set up planters and protected fruit trees from root freeze with vinyl and bags of cocoa shells, gathered seeds (especially pokeberry, goldenrod, and milkweed) for habitat and shoreline stabilization, and protected public boats from UV degradation with tarps. We donated many bricks to Build it Green, delivering them by van. Our bricks, which are molded with holes, are being built sideways into walls in South Africa to allow air circulation. Many thanks to Patricia Erickson, who directed the day’s work as HarborLAB’s facilities manager and chair of the GreenLaunch committee. A special acknowledgment to Shawn and Miyeon Cornell, who were married just this month and shared this special time with us as stellar volunteers. They are CUNY students, as is Diana Arias, another fantastic volunteer who threw herself into the work (we met her through the great Baruch College ECO Club). Rounding out the crew were Irene McLoughlin, Alessandro Byther (daring Alpinist of bricks and plastic heights), Jenna Nugent, Davis Janowski, Erik Baard, and EJ Lee (HarborLAB operations manager and a CUNY alumna). Great thanks also to Schuman Properties for our launch and to Citizens Committee for NYC for the initial GreenLaunch project grant. Much gratitude also to Folbot, Lamar Outdoors, Dorothy Morehead for our supplies. Our new shed came with its own gargoyle (Alessandro). We have no idea what Shawn was doing inside. Alessandro readies the roof at sunset. Patricia was the brains of the operation. Davis, Shawn, EJ, and Diana setting up walls. If you could video the event, please let us know. Please reply with interest by emailing harborlab@gmail.com (subject “Docent Training”) and, if possible, on our Facebook event page. This brief training is the first step to becoming a Watershed Docent in HarborLAB’s unique educational program with NYC public schools.The Catskill Watershed Corporation funded HarborLAB’s second fleet of kayaks and canoes, dedicated to the Neversink Reservoir, so that inner city youth might enjoy experiential learning about their drinking water that enriches standard curricula. We’re also very grateful to the Frost Valley YMCA for storing our boats and the NYCDEP for its many efforts on behalf of this program. Our second fleet, dedicated to providing inner city youth with educational outings in their drinking water system, was funded by the Catskill Watershed Corporation. 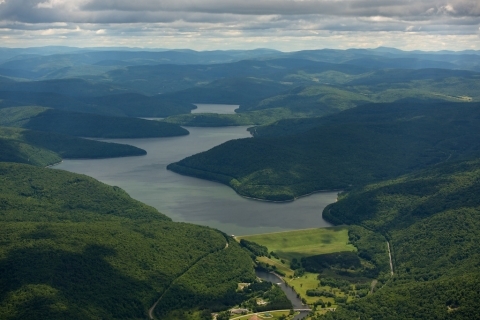 Schools and community groups can apply for Watershed Agricultural Council grants to cover transportation to the Neversink for paddling and programs that include lessons on how forests protect our drinking water. Please note that this forestry element is required. The EPA Must Test the Plants of Newtown Creek. HarborLAB caused quite a stir recently by drawing attention to the fact that the U.S. Environmental Protection Agency isn’t testing plant tissues in the Newtown Creek. This great research gap had not been addressed before. We raised the point at the October meeting of the Newtown Creek Community Advisory Group with the EPA about Superfund progress. Our concern is informed by our periodic biota surveys. We thank the United Nations Federal Credit Union and Con Ed for their support of our environmental work. The EPA noted in its presentation that it tests the tissues of some fish species, especially those most likely to be eaten by people, but admitted in response to HarborLAB’s questioning that no plant tests were conducted or scheduled to be conducted. The EPA also asserted that because the creek was so thoroughly bulkheaded, there wasn’t a plant population to test. HarborLAB has conducted bioblitzes of the creek and strongly disagreed, suggesting that nonprofits and universities could begin plant tissue tests even if the EPA wouldn’t. Representatives from Riverkeeper, North Brooklyn Boat Club, and LaGuardia Community College quickly seconded HarborLAB’s concerns. HarborLAB’s launch already boasts indigenous, salt-tolerant goldenrod, pokeberry, milkweed, and other species that support birds and pollinators. We’re working to add cordgrass, beach plum, and more as part of our GreenLaunch project. Marsh grasses, reeds, and other plants fringe the creek where there are no bulkheads or where bulkheads have crumbled. Above the bulkheads but still within occasional flood zones are a number of plant species, whether native, invasive, or cultivated. There are even fruit trees, including fig, apple, pear, and mulberry. Within the creek, HarborLAB has observed sea lettuce, bladderwrack, mosses, and more. At the request of LaGuardia Community College biologist Sarah Durand, PhD, HarborLAB has been photographing shoreline and aquatic plants. Dr. Durand and her students have begun growing marsh grass in buckets and planters as experiments in anticipation of installing habitat restoration platforms. We will soon join the Newtown Creek CAG, which counts Dr. Durand as a steering committee member, in formally urging the EPA to reconsider its assessment and add plant tissue testing. Gallery of Newtown Creek plants by Thomas Zellers and Erik Baard. Red algae species spotted at the bottom of the “steps” of the Waste water Treatment Plant nature walk. Also saw some planted Spartina there. Green moss growing near the end of the Dutch Kills, one of the few green things growing so close to the water line. Maspeth Creek reeds and flood zones species. Videos by Roy Harp showing moss and algae. Video by Roy Harp showing spartina installations. A Pyranha in the Pod! Pyranha Speeder kayak. Photo by Robert Zaleski for Canoe & Kayak. 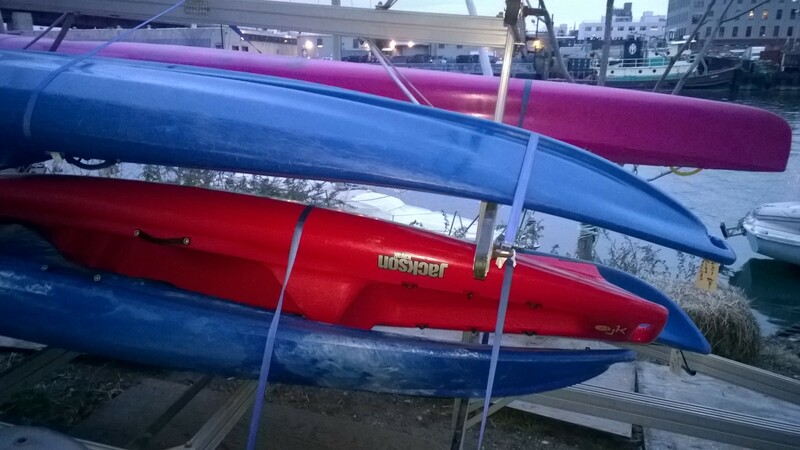 HarborLAB grew its kayak fleet over the weekend, thanks to the generous support of TF Cornerstone and the Hunters Point, LIC community! 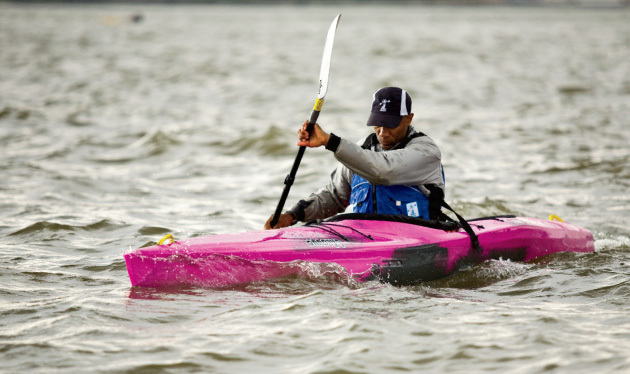 At a deep discount from our friends at the Manhattan Kayak Company, we’ve added three Jackson Kayak Rivieras, one Wilderness Systems Tsunami 145, and one Piranha Speeder. The boats were gently used, especially the Piranha, which is like new. Our volunteers will use them as guide boats for tours, runabouts for Newtown Creek monitoring, and to provide safety patrolling at our popular Gantry Plaza State Park community paddles. Now our ten signature green tandem Ocean Kayak Malibu II XL boats, proudly carrying the TF Cornerstone logo, can be fully devoted to public paddlers! Our new hot pink Pyranha will also play a special role in HarborLAB’s environmental mission as the flagship (“flagyak?”) boat for our participation in the Hudson River Watertrail Association’s annual Paddle for a Cure to benefit the Dr. Susan Love Research Foundation. As the National Institute for Environmental Health Sciences explains, breast cancer is often linked to environmental factors. In May, HarborLAB named and beautifully flagged one of its educational canoes in honor of a founder of the modern environmental movement, author and marine biologist Rachel Carson. 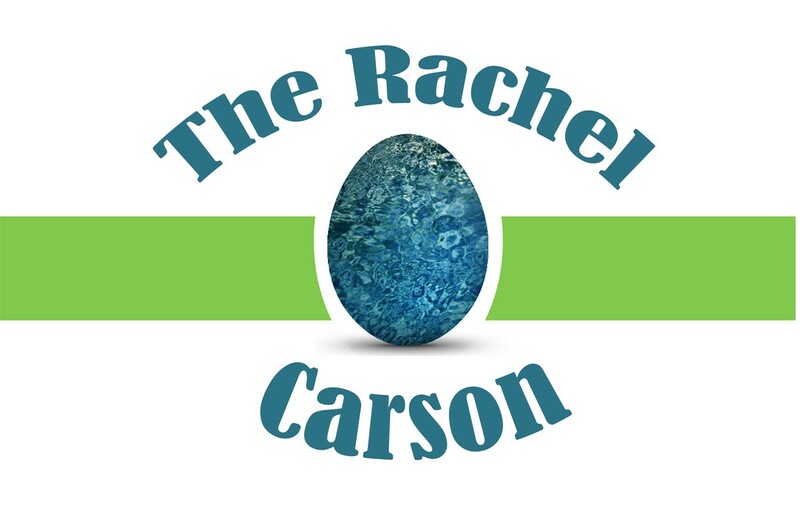 Carson died of breast cancer shortly after the publication of her landmark book, “Silent Spring.” The Silent Spring Institute promotes research into environmental risk factors in often-preventable cancers, like breast cancer. Its affiliated social and biological scientists also research how environmental injustice might contribute to the development of “cancer clusters” in marginalized communities. HarborLAB looks forward to learning how we might augment the Silent Spring Institute’s work in New York City. Many thanks to the volunteers who helped make our pod bigger! Bob Din, for helping us strengthen our relationship with TF Cornerstone; Roy Harp, for scoping out and selecting the boats; Emmanuel Steier, Joe Block, Patricia Erickson, Erik Baard, and Alessandro Byther for helping with the pickup; and Davis Janowski for helping with the pickup and deepening our relationship with Manhattan Kayak Company. We’re thrilled and grateful that American Canoe Association certified instructor, Julieta Gismondi-Grecco of Manhattan Kayak Company, has offered to provide safety training to our new volunteers! Okay, maybe Rosemary Clooney never sang “I’ll Take Menhaden,” but this fish is lately turning our city into islands of joy. Reports are coming in from the Newtown Creek, Hudson River, and upper East River that menhaden, locally known as pogy and most often bunker fish, are appearing in huge numbers. The video above was posted by Riverkeeper, the most active nongovernmental estuary environmental litigator in our estuary. That’s great news for whales and other sea mammals, as well as bluefish, striped bass, herons, egrets, and other larger fish predators. You’ll see huge swaths of water dance and glint when bunkers breach to escape predators below. Before they’re ever visible, they ride currents into our estuary as eggs and hatch here, to grow from larvae into adult fish. Bunkers do more than directly sustain these other cherished species as food. For their ability to clean water, these silvery schoolers can be seen as mobile oysters. As “Four Fish” author Paul Greenberg notes, “An adult menhaden can rid four to six gallons of water of algae in a minute.” Much like huge baleen whales, little bunkers are filter feeders. When their numbers plummet, brown algal tides overtake bays, creating dead zones. Before European colonization, Native Americans ate these fish and used them as fertilizer because their oiliness is both delectable (fishers say you’ll never have to butter a bunker) and a powerful nutrient. Indeed, the words menhaden and pogy derive from Algonquin terms referencing the fertilizing practice. Sadly, bunker fish haven’t had a good century. they died in masses in the 1980s when bluefish herded them into hypoxic shallows in the the Long Island Sound. They’ve been overfished for 32 of the past 54 years, according to the Atlantic States Marine Fisheries Commission. Commercial operators spot schools by airplane, deploy refrigerated ships to the area, and catch bunkers with nets and, because they school so densely, vacuums. A single fish oil and fish meal company, Omega Protein, is responsible for 90% of the nation’s catch. It’s not active in the NYC region. Interestingly, what could spare the bunker is what it eats: algae. Companies are starting to farm algae in vats to produce omega-3 fatty acids and other goods for nutritional supplements and livestock feeds. The controlled setting also prevents mercury contamination and other potential pollutants from entering human food systems. May 9: Riverkeeper Sweep Season Opener! Thinking ahead to spring yet? Well, here’s a glimpse of our May 9 season opener! 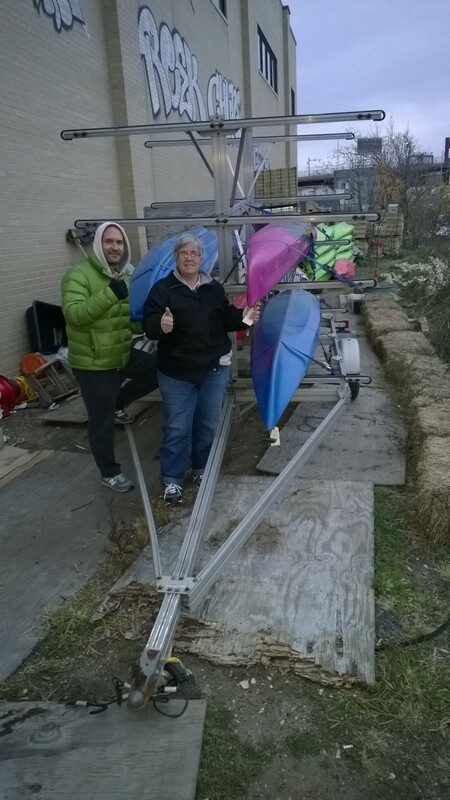 We’ll hit the water for the first time next season as part of the great Riverkeeper Sweep! Community groups throughout the estuary will clean our waterways. Plastic debris is carried into the Newtown Creek from streets by combined sewer overflows (http://www.riverkeeper.org/campaigns/stop-polluters/sewage-contamination/cso/) and wind. “Lady Ganga” and Her Voyage to Save Lives. Those who HarborLAB seeks to serve above all are the youth of New York City. Our core mission is to instill in them a love of socially responsible science. No young person should lose his or her mother, or one day her own life, to a preventable killer like cervical cancer. Sadly, millions of women worldwide die from this disease each decade, and many millions more are left in pain and unable to have children. Men suffer from similar cancers. The cause is the human papillomavirus, which infects most sexually active adults in the U.S. at some point in their lives, and is preventable with a safe vaccine. This shot, which can be given along with other routine vaccinations, is most effective when administered before the patient becomes sexually active. Some express worry that taking this measure cautiously early — with preteens and early teens — will encourage promiscuous behavior, but only doctors and parents need know the purpose of this one vaccine among several. This is a life-saving, moral application of science and it’s available to all families in New York City. Click here to learn more. Tragically the HPV vaccine not as available globally. Stand up paddleboard athlete, kayak guide, and mother Michele Frazier Baldwin dedicated the last months of her life to a record-setting 700-mile voyage down the Ganges River to raise awareness and funds so that girls raised in poverty can be vaccinated. She asked that donations be made to the Global Initiative Against HPV and Cervical Cancer. A film is being made from raw footage of that meaningful adventure, with all profits going to the cause she championed. You can help by contributing to the Kickstarter campaign for the film, “Lady Ganga,” by Frederic Lumiere. We honor Michele Frazier Baldwin’s life, paddling accomplishment, and great cause. We also respect, and advocate for, the moral application of medical science to save the lives of young people just as we respect, and advocate for, environmental science to save the lives of humans and other species with whom we share the Earth.